So what have I learnt about finding a place to live in Barcelona? I wasn’t aware it would be such a hard task to find a place to live, bu here’s a little guide for anyone who might need it! The one and most important page to use is http://www.loquo.com/en_us . (Yes, the page is in English too!) Choose Barcelona in the side-bar. (This page is working for many cities in Spain.) It’s a genius community-site where you can find mostly whatever. Although I would love to get a flat to myself …when in Rome… I am doing it the Spanish way, like I explained here , so a room in a shared flat was what I looked for. There are hundreds of ads for rooms added every day, so it’s important to check back a few times a day to see what’s new. 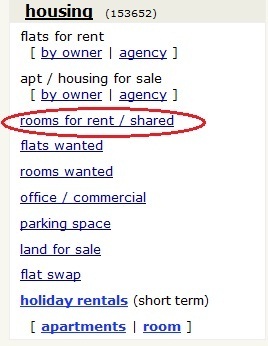 Look under “Housing” and then “Rooms for rent/shared”. A relatively centric room in a good area and a good flat should be priced between 300€ and 400€ depending on how many sharing the flat, the facilities of the flat etc. There are many neighbourhoods in Barcelona, and some of those considered most centric are: EIXAMPLE, EL GOTICO, EL RAVAL, around PLAZA CATALUNYA and PLAZA UNIVERSITAT. A basic rule (with a few exceptions) is that the further away from Plaza Catalunya you are, the cheaper it gets. It’s important you read the ads with a critical eye. Don’t be naïve. 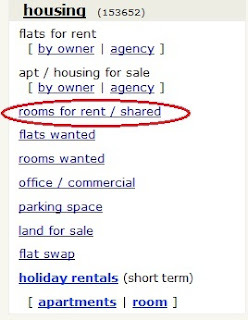 If you’re a girl and you find an ad from a guy renting only to girls, try to read between the lines. If he says things like “price can be discussed”, don’t be surprised if he is going to offer you a room for free in exchange of … “various services"! Ok, you're allowed to be surprised, but now I have warned you! Go see the room as soon as possible, and get a feeling about the people renting it. They want to meet you to decide if they want you there, but sharing a household is a two-way-street, it’s important that you also feel comfortable with those living there. In the end, I am living in a quite nice flat, sharing with only one person, in a nice and centric area, and right now I wouldn't want to change a thing about it!